Check out this season’s running shoe guide and you will undoubtedly be overwhelmed by the options, each model carrying its unique promise for improved comfort and performance. Your traditional shoes guarantee the perfect level of support and motion control, your minimalist shoes provide unprecedented ground feel and flexibility, and – at the opposite end of the spectrum – the growing maximalist varieties offer ultimate cushion and protection. How does a runner filter through these claims to select a shoe that lets them achieve their goals of running faster, healthier or stronger? So far, research into the effects of footwear on running performance, efficiency and injury prevention have been inconclusive and downright confusing. Think twice before accepting a claim that shoe X is proven to make you faster or stronger; the manufacturer will likely be the next in a growing line sued for false advertising. The evidence just isn’t there … yet. To better understand the reason for these mixed findings, we first need to clarify how different types of footwear influence our body’s structure and function. A study 1 recently published in the Journal of Sport and Health Science aimed to do just this, examining how training in conventional or minimalist shoes affects foot structure and strength. Thirty-three runners were assigned to a 12-week training regimen in either a conventional shoe (cushioned with an average 12 mm heel-to-toe drop) or a minimalist shoe (uncushioned with 0 mm or 4 mm drop). The participants were all experienced, having run consistently for at least the year prior, and had never run barefoot or in minimalist shoes. Both groups maintained their prior running volume, an average of 30 miles per week, with the control group continuing to run in conventional shoes and the minimalist group gradually increasing the percentage of their mileage run in minimalist shoes. By the end of the study, the minimalist group showed changes in several biomechanical and structural features. While the control group maintained a predomintly rearfoot strike, the minimalist group reduced their dorsiflexion at foot contact and shifted to a more midfoot / forefoot strike. This was expected, as many past studies 2,3 have shown that barefoot or minimalist running encourages midfoot or forefoot striking. Given that minimalist shoes altered the runners’ mechanics, the researchers collected MRI scans of the runners’ feet pre- and post-training, to test whether the transition also affected their foot strength, focusing on three large muscles in the arch (see figure). The volume of the flexor digitorum brevis increased similarly in both groups, showing that the training program was generally effective at increasing foot strength. But the minimalist group demonstrated two additional changes. 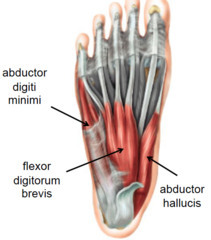 The area and volume of another foot muscle – the abductor digiti minimi – increased, and the arch became stiffer in runners wearing minimalist – but not conventional – shoes. Anyone who’s given minimalist shoes even a brief test run will attest to the subjective difference between running with or without a rigid, cushioned shoe. Only now are we slowly piecing together the physiological changes underlying this experience. This study confirms what we’ve known for some time, that a minimally invasive shoe allows the foot to move differently from a standard shoe. But what’s more, it also confirms much speculation that less support benefits our foot musculature, increasing the size and strength of the arch. The authors posit that these mechanical and structural effects are related, such that the shift toward forefoot striking more strongly engages the intrinsic muscles of the arch 4, building a strong, healthy foot. However, these findings offer only a glimpse into the presumably complex adaptations to minimalist footwear. Although this was not tested, the observed strength gains presumably resulted from greater activation of these foot muscles. Hopefully, future studies will fully characterize just which muscles are differentially recruited, and when during the gait cycle. In addition, the training period was relatively short and the running volume moderate in this study. Thus, we’ll have to wait for follow-up studies to understand the changes that occur over years of minimalist running, or in higher mileage endurance runners. These findings are certainly an important step towards unravelling how a shoe – or lack of shoe – influences foot strength and function. But don’t expect it to settle the mini-versus-maxi shoe debate just yet. I expect these findings to be interpreted as fuel for both sides of the argument. Does a supportive shoe reduce the foot’s workload, in turn offering a performance boost? Or do the higher functional demands of a minimalist shoe lead to stronger, more efficient running? Might both scenarios be possible? Miller EE et al. 2014. The effect of minimal shoes on arch structure and intrinsic foot muscle strength. J Sport Health Sci. Lieberman DE et al. 2010. Foot strike patterns and collision forces in habitually barefoot versus shod runners. Nature. 463:531-5. Perl DP et al. 2012. Effects of footwear and strike type on running economy. Med Sci Sports Exerc. 44:1335-43. Tags: foot arch, foot strength, footstrike, minimalist shoes, research, running, running form, running shoes, sports science. Bookmark the permalink. Pingback: Foot strength, running style and running shoes; what should you believe? Thanks for taking the time to discuss the different types of running shoes and their implications on foot well-being and health, many people tend to focus on style instead of comfort, so they will find this post enlightening.